Here’s the weekly update where we shout-out heroines of both the fictional and non-fictional varieties. It seems Team Unicorn geek girl Clare Grant got a little banged up. I always look forward to her cosplay at conventions. Wishing her a speedy recovery. The women who run GeekGirlCon are most definitely heroines in this geek girl’s eyes. The con staff has posted a lengthy Thank You to everyone who helped make last weekend’s convention such a great success. It includes another adorable picture of Darth Makenna, who won everyone’s hearts with her cuteness and enthusiasm. I had the pleasure of meeting Darth Makenna when I wandered into a corner to go over my panel notes. She wanted to see what was in my box, which happened to be Star Wars swag from Del Rey. Makenna eagerly looked through the goodies and decided the Chewbacca bookmark was just her style. And how about that pink lightsaber?!? Looking ahead to Celebration VI next week, thanks to Amy Ratcliffe for making sure we don’t miss the series of craft videos Amanda Jean is sharing in the lead-up to the convention. So much to do and so little time. 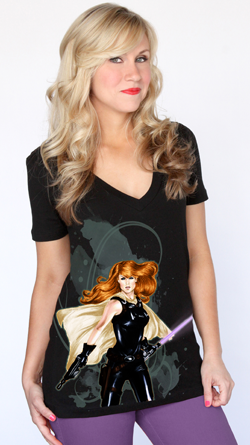 And on Tuesday, Her Universe revealed the exclusive Mara Jade shirt design. Only 300 for sale at the convention and 50 online, and they’re sure to go fast. 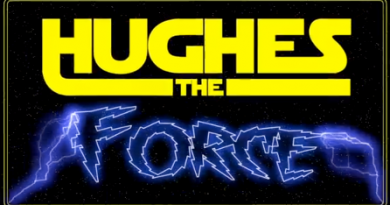 Ashley explained that Her Universe does not have the license for Expanded Universe shirts and needed special permission to make this one happen. 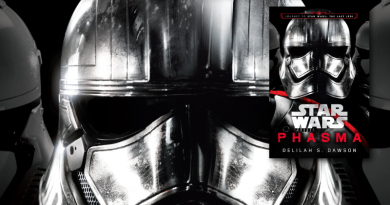 Speaking of Star Wars, Star Wars Book Report has a great interview with EU author Karen Miller about her recent Myri Antilles short story in Star Wars Insider. Her segment starts about 45 minutes into the podcast, and it’s well worth a listen for her insights into storytelling, characterization, and female characters. In the same podcast, Jesse and Wayne chat with Bryan Young of Big Shiny Robot about the EU panel at San Diego Comic-Con. They expressed a similar reaction to the books announcements that I posted last week, including mention of the concerns about female characters in the recent EU offerings. The more people who speak up like this the better, in my opinion. Thanks to Ian Miller, a regular in the Cantina and another male fan who’s been disaffected by much of the recent EU (excepting the recent Mercy Kill), for bringing it to my attention. Wouldn’t that be amazing? The current EU does have a few male authors who write strong female characters well, including Aaron Allston, and the recent hire of Brian Wood to write the new Star Wars comic for Dark Horse appears to be another step in the right direction. Still, I think we need more female writers. With that said, simply hiring female authors isn’t enough, either, as recent history has amply demonstrated. Hiring a female writer with credibility as a creator of strong female characters, like Gail Simone, would be a huge statement to the fans about the direction the EU stories are going. It’s my opinion that all the novels need a bit more authorial push to compete in the current book sales environment. A book featuring a female character in the lead will require even more of an authorial ambassador who’s active and visible like Gail Simone. 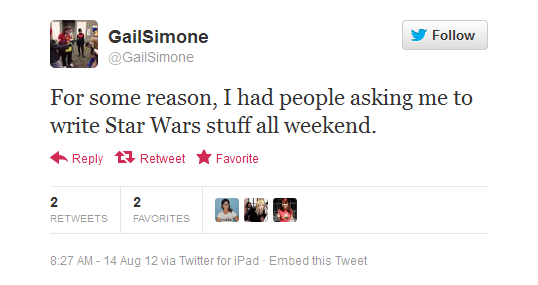 While a Gail Simone Star Wars comic would be pretty darn awesome, she noted in her panel this weekend at GeekGirlCon that she started in prose and novels were something she’s interested in pursuing. Finally, last night was the premiere of the new series Collection Intervention on Syfy channel. The inaugural episode featured Consetta Parker, her husband Garet, and their massive collection of Star Wars collectibles. She was understandably a little anxious before it aired, but I agree with the sentiments of this Geek Watch review from The Detroit News that the show was well done and respectful. Thanks again to Dunc for retweeting the link, and thanks to Consetta for wearing my Chic 2BA Geek shirt during the opening segment. Thank you for mentioning our podcast and interviews. I really appreciate it. Thanks. I so want that Mara Jade shirt. I wish it wasn’t limited, but I’ll do my best to grab it. Hopefully it won’t sell out immediately. Thanks for giving the heads up here. OMG! YOU ARE SO RIGHT! OMG! 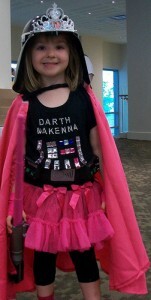 Darth Princess is the one thing I’ve seen *everyone* who attended Geek Girl Con mention. She is universally beloved. Personally, I think they should bring her on staff for next year.